Allow your visitors to view your livestream and chat at the same time. Embed the chat on your website with just a few lines of code, and your visitors will be able to talk with one another, without leaving your website. Our service is easy to use and we're committed to providing a great experience for everyone. Minnit is supported on all major browsers. Changes to chat settings happen in real time for everyone on your chat. This means that changing your background, theme, staff ban time, etc doesn't require anyone to refresh to see the changes. Lots of users asking questions at once? You can pause the chat for a specified amount of time to prevent users from sending messages and answer the questions. It's hard to have a discussion when everyone is talking at the same time. Subrooms automatically split the chat into separate rooms when you get a lot of users. Your staff will always be able to move between subrooms even if they are full, so your chat always stays moderated. You can configure how many users there are per subroom, or turn this feature off completely. Want to split your chat up into different categories? You can create custom subrooms that always remain open and configure who can join and talk. So try it out. After all, it's free. Sign up and create your chat now. You can upload a custom background, change your chat's theme, change how long your staff can ban for, enable a captcha to stop bots, add a radio IP and much more. All for free. 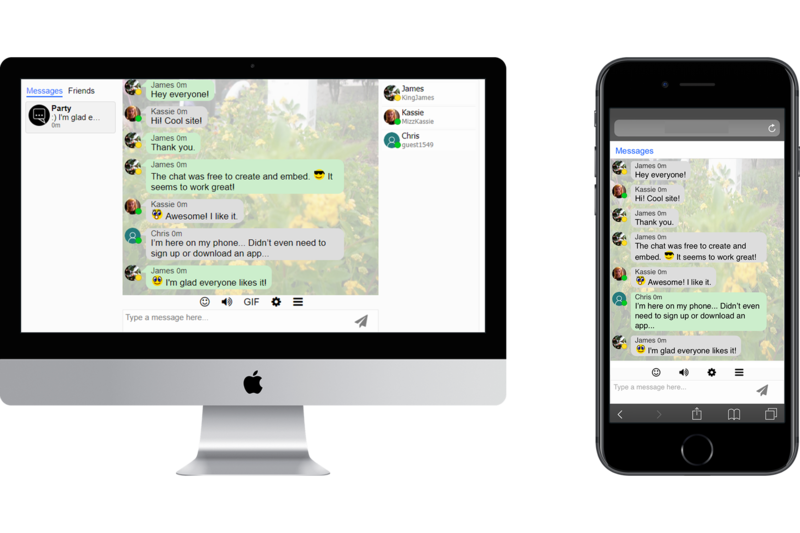 You can get a free chatroom bot which can help keep track of new users, respond to various commands, and more. Upgrade your Bot to Premium and it can automatically moderate your chat, respond to triggers and much more! Embed the chat on your website by just copying and pasting a few lines of code. Customize their smilies with color options, different eyes, hats, and glasses. New smilies and customization added frequently. Have an issue or a feature request? Open a ticket and we'll try to help. We usually reply to all support tickets a few hours. You'll join as a guest, but you can click on your name to change it. Like what you see? Sign up and create your chat now.